I like to announce my new tree creation addon Space Tree Pro that will appear on Blender Market on June 25. The add-on is a natural evolution of my free space tree addon, with a vastly improved user interface, the possibility to influence the shape of the trees with the grease pencil, better tree trunks that are uv-unwrapped and generated faster, and a nice starter set of ready to use trees (that can be used as is, but are even better suited as a starting point for your own trees). 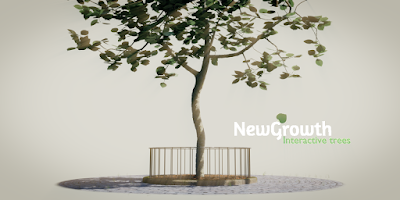 Combined with the tutorial videos and a comprehensive manual I hope it will help people create many trees quickly with minimal effort, without sacrificing the individual character of each generated tree and offering great flexibility in blending trees with their environment. Of course the add-on still has all the features of its free counterpart as well, like the possibility to shape the crown with groups of objects, defines shadow groups and exclusion zones and create trees or hedgerows with multiple trunks. Another new feature is that all configuration parameters are stored with the generated tree, which means you can create libraries of trees in separate .blend files and those trees can be loaded and tweaked again with the add-on. Check Blender Market soon and I hope you will find the offer worthwhile.